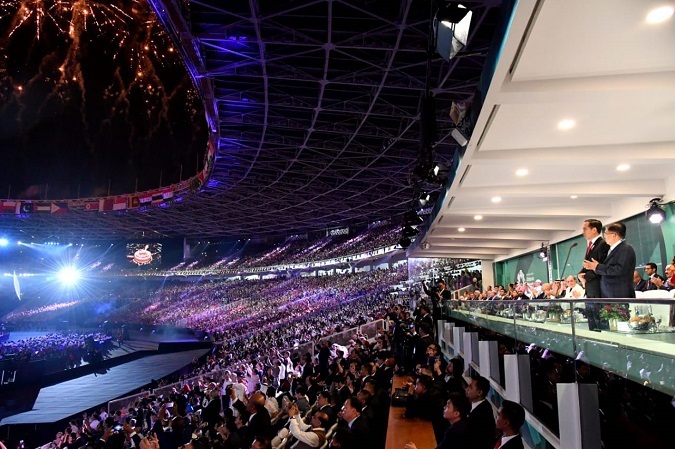 For the second time in history Indonesia hosted the Asian Games (the first time being in 1962). Between 18 August and 2 September 2018 the event was held in the Indonesian cities of Jakarta and Palembang. While, initially, there had been some concern about whether all infrastructure would be ready before the start of the Games and whether radicals would be eager to attack, at the end of the day everything went rather smoothly even though Indonesia only had two years and four months to prepare itself for the event (after Vietnam pulled out suddenly). Still, there were some complaints made by foreign media. For example, about the low speed of the Wi-Fi and also the limited availability of the special shuttle buses for media institutions. Organizers also struggled with a defective ticketing system during the start of the event. This resulted in the situation that at several sport events many enthusiasts were left without tickets despite plenty of empty seats inside the venues. But, overall, Indonesia did a good job. Also International Olympic Committee President Thomas Bach praised Indonesia's success in hosting the 2018 Asian Games and especially had kind words to say about the people of Indonesia. “You can see a great combination of friendliness and efficiency at the same time”, Bach said about the Indonesian people. The Asian Games are no small event. In the context of the event, Indonesia welcomed more than 17,000 athletes and officials as well as around 150,000 supporters from across Asia. Athletes competed in nearly 500 events consisting of 40 sports disciplines.